Janet Tinsley, the mother of slain 8-year-old April Tinsley, said Tuesday she will push prosecutors to seek the death penalty for the man accused of killing her daughter. John D. Miller, 59, was arrested Sunday and is charged with murder, child molesting and criminal confinement in the girl's 1988 death. Police said they used DNA evidence and genealogy data to track him down. Allen County Prosecutor Karen Richards held a news conference earlier Tuesday to thank investigators for work on the case. She would not discuss whether she'll seek the death penalty for Miller. 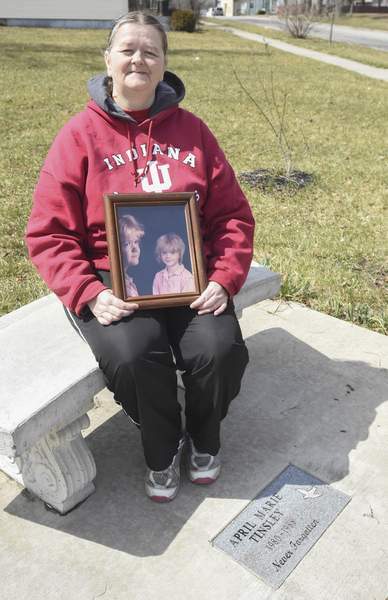 April was abducted April 1, 1988, near her home on Fort Wayne's south side and was sexually assaulted and strangled at Miller's home in Grabill, according to court documents. A jogger found her body three days later in a ditch along DeKalb County Road 68. The case remained open, and investigators spent decades reviewing tips and evidence, including DNA left at the crime scene and other locations. Evidence was not strong enough to lead to an arrest until July 9, when investigators at the Indiana State Police Laboratory in Indianapolis told Fort Wayne police that DNA from condoms found at Miller's home matched DNA from condoms recovered in 2004 and from April's underwear in 1988. A private research company on July 2 used the DNA to narrow the search for a suspect. Tinsley learned of the arrest Sunday afternoon, when she said Richards and three investigators visited her home. The news was a shock, she said, but it's starting to sink in. Michael, her husband, has been struggling with the news and details of the case, she said. She said he often hasn't taken calls or read text messages since Miller was arrested. Details made public about the case do not indicate a relationship between Miller and the Tinsley family. Janet Tinsley said she does not know Miller, and three detectives who worked the case in 1988 said his name was not among a list of suspects developed after April was killed. Indiana law allows prosecutors to seek the death penalty in murder cases if there is at least one aggravating circumstance. An aggravating circumstance could be killing while committing another serious felony such as child molesting. Miller appeared Monday in Allen Superior Court, and prosecutors are expected to file formal charges against him Thursday. Janet Tinsley said she wants to be in the courtroom the next time Miller appears. “Right now, I'm just numb,” she said.